Complete installation instructions are included to adapt the fan blades to your existing fan blade arm hole patterns. Easily replace worn or broken fan blades on your existing outdoor fan with this convenient five piece set. 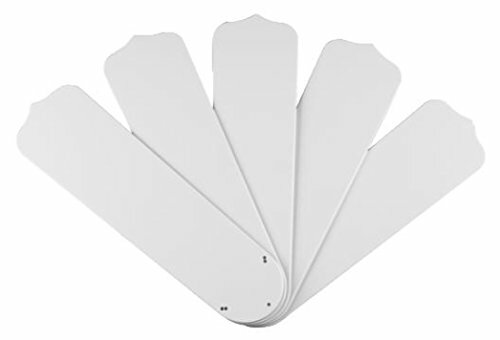 The Outdoor White 52-inch Replacement Fan Blade five-piece set is your solution for worn or broken fan blades on your outdoor ceiling fan. With a fresh white finish to complement many outdoor ceiling fans, these weatherproof blades are durable enough to withstand outdoor climates. Complete installation instructions are included to adapt the fan blades to your existing fan blade arm hole patterns. Refer to Figure 1 for fan blade hole distance: A - fan blade outer holes 3-15/16-inch width B - fan blade outer hole to center hole 2-3/4-inch width For proper balance, and to restore optimum performance, make sure to replace all the fan blades on your outdoor ceiling fan. Compatible with most 52-inch fans, these blades can be used with fans that have 5 blades or less. Westinghouse is a trusted, global brand. Westinghouse knows lighting and offers products with exceptional quality, reliability and functionality. Product reference number 77414.